If they're followed, the laws will change the rhythm of New Yorkers' interactions with cops during encounters such as searches, frisks and sobriety checkpoints, according to the Civilian Complaint Review Board, the city's independent police oversight agency. "Central to the law's goal is improving transparency in policing by reducing the confusion civilians often have when officers ask them questions or stop them on the street," said CCRB Chair Fred Davie. One component requires that officers seeking permission to search someone explain that the person won't be searched if they refuse. Cops also have to record such searches on body cameras if they're wearing them. The other piece requires officers to give their name, rank and command whenever they detain or, in some cases, question someone. They're also required to provide a business card at the end of the encounter with their name, shield number and information on how to file a complaint or request body camera footage. But cops don't have to give out cards when they're just asking for someone's identification or seeking basic information, according to the CCRB. The carve-out was a point of contention last year for some progressive Council members, who argued the compromise would not apply the law to many civilian interactions with police. The CCRB says anyone who thinks a cop may have violated the new rules or is unsure whether they were followed can file a complaint at nyc.gov/ccrbcomplaint. The Right to Know Act was first proposed as part of a broader legislative effort to combat the NYPD's controversial stop-and-frisk practices, which were ruled unconstitutional in 2013. Lawmakers stood by the measures as an important step toward improving trust between cops and the people they police. "The unconstitutional practice of stop and frisk eroded this trust, particularly in communities of color," Councilman Antonio Reynoso (D-Brooklyn) said in a statement Thursday. "The implementation of the Right to Know Act will serve as a step towards rebuilding this relationship." But the law still faces criticism on both sides of the badge. Police-reform advocates this week raised questions about whether the NYPD would faithfully implement the laws, saying in a letter to Mayor Bill de Blasio that the department didn't consult communities as it developed guidance to cops. Dozens of advocacy groups, including the influential Communities United for Police Reform, also opposed the compromise on the identification law that ultimately got through the City Council, saying it contained counterproductive loopholes. 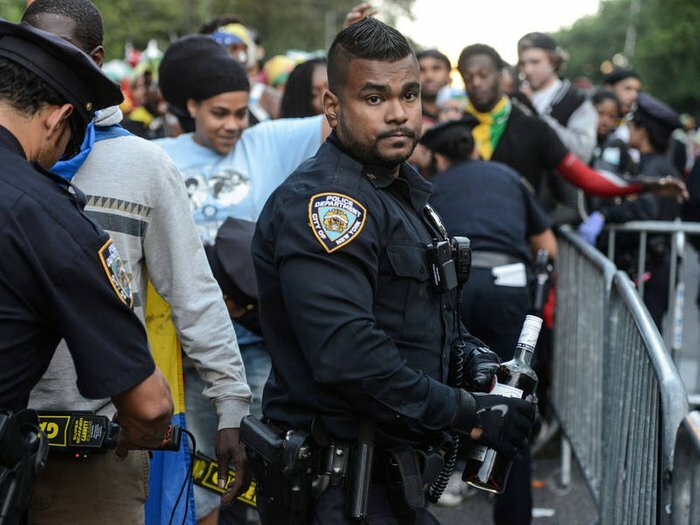 "We know from experience that the NYPD has a history of not following through on concessions gained through public pressure," Loyda Colon, co-director of the Justice Committee, said in a statement Thursday. "There is no way we will know if officers are adhering to the law unless we watch them." The city's largest police union, the Patrolmen's Benevolent Association, also has qualms about the laws. Union President Patrick J. Lynch said they'll discourage cops from "proactively addressing crime" and just lead to more "frivolous complaints." "The City Council has continuously piled on new burdens and second-guessing for our police officers, creating unnecessary distractions for them that will ultimately make NYC a more dangerous place," Lynch said in a statement Friday.